If you're a big movie geek (like anyone who writes for this site) then you're probably familiar with Scott C.'s artwork, cute little colored drawings of various characters and scenes from movies. He's more commonly known as "Scott Lava" and posts a lot of his updated artwork on his own Tumblr at greatshowdowns.com. For a few years, Scott has been creating a series called Great Showdowns which showcases "some of cinema’s greatest (and sometimes lesser known, cult) rivalries." Our friends at SlashFilm reveal that he's printing a hardcover book of the entire collection, which goes on sale this October for only $10. Awesome! 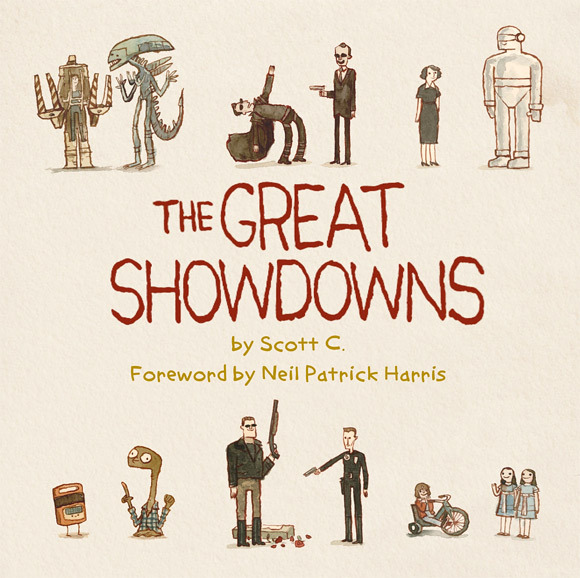 Here's a look at the cover for Scott C.'s The Great Showdowns, which you can pre-order on Amazon now. The book is being printed by Gallery 1988 and Titan Books, and will arrive on hardcover late this October for only $10, which is a good deal. Han vs Greedo. Chief Brody vs Jaws. Die Hard’s John McClane vs broken glass. Scott Campbell’s classic Great Showdowns series, showing strangely good-natured confrontations between your favourite movie characters, finally gets the book collection fans have been demanding! "In this beautifully funny chronicle of the world's most momentous confrontations, there is only one true victor. And his name is Scott Campbell," Edgar Wright comments on the book. I'm personally a huge fan of Scott's work and love his Showdowns series, with the D9 one being one of my faves (seen above). I'm buying this!